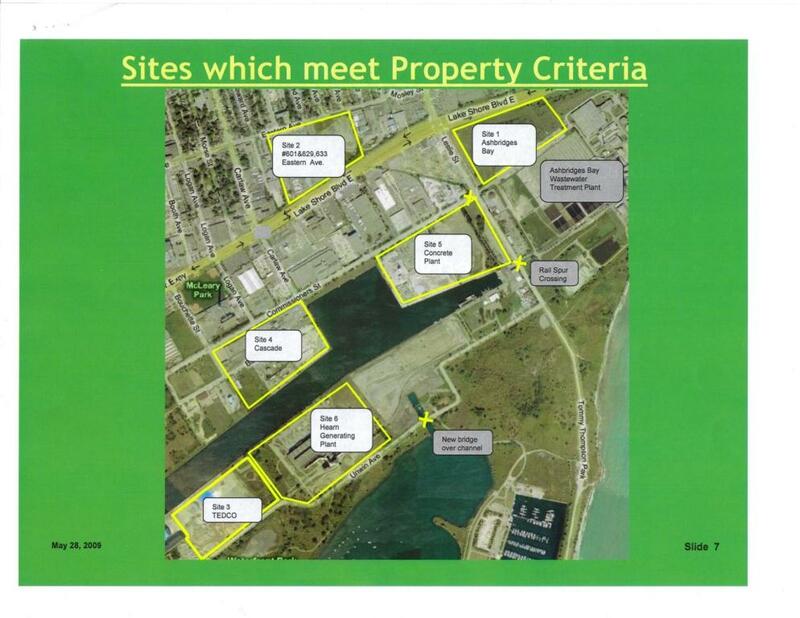 It would seem that the sites at Eastern ave, and north of the treatment plant would be front runners. The remaining sites border onto the ship turning channel and could (would?) ruin any attempt at creating an urban canal there. 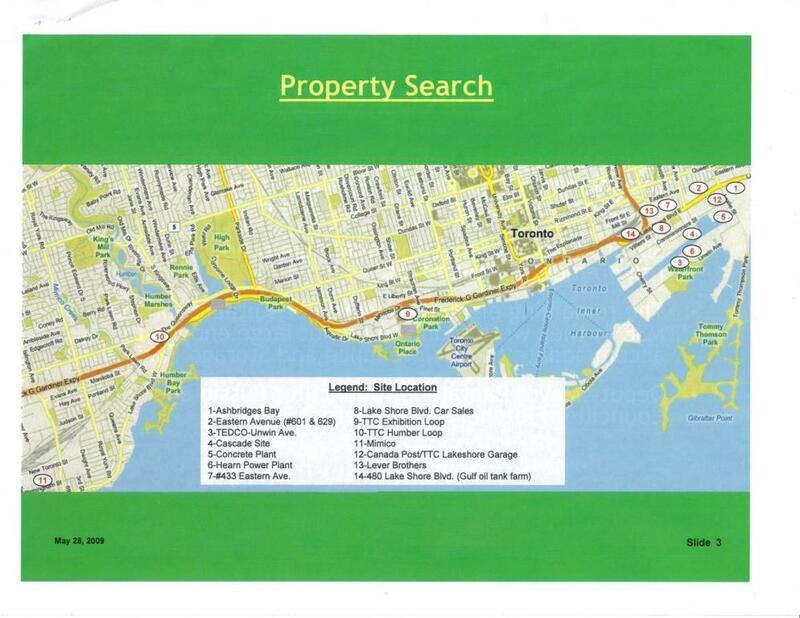 As you would need shops, homes, and businessess there not a transit storage facility. John is right, though the dream of the ship channel as an urban canal has probably already been ruined by the new power plant (in the “short list” photo, it’s been built in the empty spot NE of the Hearn). 629 Eastern (part of site 2) is the Toronto Film Studios, isn’t it? That’d be an interesting outcome of the whole Smartcentres controversy. Site #5 (The Concrete Plant) would seem like a non-starter to me since the City and the various cement companies have been busy moving concrete plants to that very area. The concrete plant (St Mary’s) which used to be opposite Fort York moved there only a few months ago. I think it’s a pity we’re not looking at some kind of storage facility in the Etobicoke industrial lands – it would be a statement of intent for not just Western Waterfront but perhaps an eventual N-S LRT in the Kipling area. I don’t think there will ever be a N-S LRT from lakeshore. Kipling has both wide and narrow section all the way to Bloor and there would be several options to overcome (ex: the lakeshore rail bridge, Gardiner expressway etc…). As well I don’t think demand will ever reach a point where would need LRT seeing as the industry lands along Kipling will probobly never be developed for residential or commercial purposes. But i’m not the expert here, Steve what do you think? Steve: I agree that the south end of Kipling is not LRT territory. We need to avoid proposing LRT construction in marginal areas that would undermine the credibility of the overall scheme such as the western part of Lake Shore Blvd. The ideal location to me, is the former site of King carhouse, but, I guess it is not available? Steve: That site will be a major new housing neighbourhood. Site preparation and utilities work are now in progress. The site at the treatment plant would seem (by the map) to require removal of the high berm that hides the treatment plant from view removed. ughh! Access up Leslie is only as far as Queen. North of Queen, it’s a small residential street. The part south of Queen is very busy servicing our main retail area. The Eastern Avenue site is apparently to be inviolably held for the creative industry. I’d hope that maintaining the new LRVs is not a creative industry! re: Western N-S LRT – I said Kipling “area” (i.e. perhaps partly within hydrocorridor) not necessarily Kipling Avenue to the Eglinton line at Martin Grove, although the bit from Humber Lakeshore to Kipling TTC/GO would likely be. I’m thinking more a 192 replacement than a direct 45/46 replacement. I also said “eventual”. If LRT takes off in this town the way most readers of this blog hope it does, hopefully we can raise our sights on what is categorised as “marginal”. I believe there is potential for an LRT on Kipling between Lake Shore (Humber College) and Kipling subway station. The #44 already sees a lot of buses, and the college is in the process of fixing the remaining buildings on the property (it also opened a residence there about four years ago), and there are a number of industries north of the Queensway. My concern with an LRT in that area is actually how many riders use the #44 at moment (that means both rush hours, during the day, and a breakdown between the September-May period when the college is in full force vs. the June-August period), and the potential for increased service. Using current demand is not enough to say whether or not an LRT would work. There is also the issue of how (and where) the LRT would actually operate (for example, it could run east from Kipling on the Lake Shore, and then up Islington to Islington Station (or somewhere else.) Or after stopping at Kipling (the space for an LRT line exists opposite the bus bays), the LRT could head somewhere else. This is another issue – where would it actually go. Wherever they put the new car house it should have at least two connections to the existing lines, preferably one to the west and one to the north or east. Ideally it would be on the intersection of two lines such as Roncesvalles so that there are multiple connections to the rest of the system. A facility with only one connection could find itself isolated by a major accident or track job. I can just see the TTC trying to figure out where they are going to store 150 cars while the rebuild the only road to the car house for the legacy fleet. Maybe they could lay a lot of temporary track at Hillcrest if they still have it. Steve: The second connection to a Port Lands Carhouse will be west to Cherry Street as per the transit plans for this area. Speaking of Hillcrest the ALRV’s will not fit on the transfer table so what are they going to do about heavy maintenance for 28 m long cars? I assume that this new facility will also be the heavy maintenance site for the LFLRV’s. Steve: Yes, the new carhouse will be the maintenance facility for the new streetcar fleet. I agree that from an operational point of view it is nice to have a car house in the west end. I think it should stay at Roncesvalles because of its proximity to four routes in or out. A new facility in the Kipling area would be too isolated for the legacy lines, accessible only via Lakeshore. If you tried to use it for new transit city lines also, then it would have to be able to support two voltages, 600 and 750 VDC. This would be a major headache. For these reasons I am not in favour of building a legacy system car house at Kipling but am in favour of leaving one at Roncesvalles. Yes but will there be two directions that the LRV’s can turn when they exit the car house to get to the rest of the network from ALL six options that they are looking at?